New Delhi, April 17 (KMS): In an effort to boost the sinking morale of its forces in the wake of 27 February fiasco, India has granted emergency powers to the three services to procure weapons and military hardware in the name of enhancement of operational preparedness along the Line of Control and international border with Pakistan. 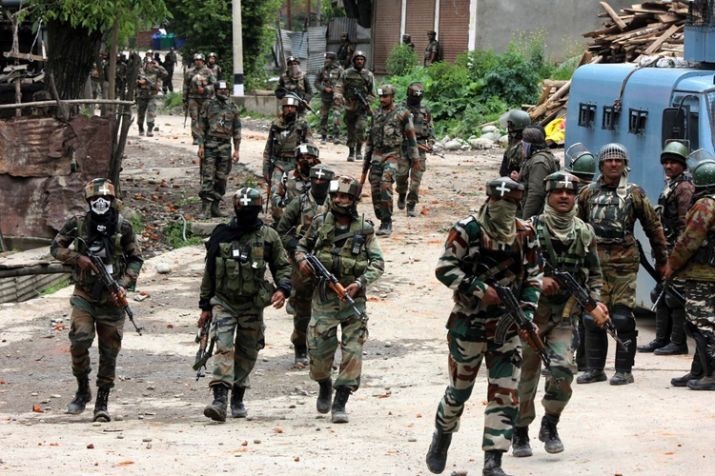 Srinagar, April 17 (KMS): In occupied Kashmir, Indian troops launched a cordon and search operation in Tral town of Pulwama district, today. Srinagar, April 17 (KMS): In occupied Kashmir, a study conducted by the Department of Psychiatry of Government Medical College (GMC), Srinagar, has revealed that 85 % of pellet victims were diagnosed with a psychiatric disorder. New Delhi, April 17 (KMS): India’s Enforcement Directorate has attached assets worth millions of Rupees of illegally detained Kashmiri businessman Zahoor Ahmed Watali in a false case registered against him in occupied Kashmir. Srinagar, April 16 (KMS): In occupied Kashmir, the All Parties Hurriyat Conference Chairman, Syed Ali Gilani, has urged the people to observe complete election boycott and shutdown on Thursday (April 18) in poll bound areas of Srinagar, Badgam and Ganderbal. Srinagar, April 16 (KMS): In occupied Kashmir, the Hurriyat forum led by Mirwaiz Umar Farooq has expressed serious concern over the escalating tension between Pakistan and India, especially in Poonch and Rajouri sectors resulting in immense human and other losses on the Line of Control.